Here are some of the media stories about C-FLUG and the growing list of pilots. The Ninety-Nine News magazine's Dec 2013 issue introduces a few of the C-FLUG pilots. Check out the article on page 24. Want to know about the Ninety-Nines, Inc.? Canadian Aviator Magazine's March/April 2014 issue publishes feature story on C-FLUG. 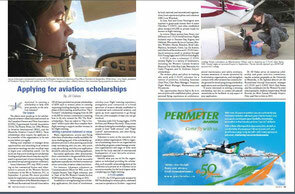 The article is called "An old 150 Attracts New Pilots", and is on pages 20-23.